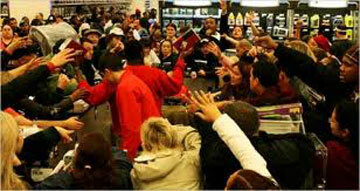 Tonight we will see one of our national pastimes on the evening news .... that ugly phenomenon known as "Black Friday." Since the early 2000's, retailers have trumped up their sales by making this an official "Event." In fact, it has almost become as important as the holiday that launches it, Thanksgiving. Shoppers used to be able to begin their Christmas shopping at 4:00 AM on the Friday morning after Turkey Day; but that time has arrived earlier through the years, with many stores opening at midnight. This year, one of the biggest retailers in the country, Wal-Mart, has set a new benchmark: 8:00 PM on Thanksgiving evening. And that is causing a storm of controversy that threatens to tarnish the entire holiday season. Retail employees balk at having to give up precious family time on a traditional holiday to come to work. And I don't blame them! Frantic shoppers line up for hours, even days, for a coveted spot in line; just to have the opportunity to grab whatever marketers have deemed to be the "it" gift. But this year, employees have planned a staged strike, and Big Retailers are threatening action by the courts. All for the sake of the Almighty Dollar. So much for the Season of Good Tidings! Personally, I'm one of those people who hate crowds, and I stay as far away from the malls and the madness as possible. And I guess I just don't get why someone would sleep on the sidewalk for hours, just to be the first in line for a few dollars' savings. I also don't understand how we've gone from a nice, leisurely, month-long shopping period in which to get that perfect gift for that special someone .... to blowing it all out in the first weekend after Thanksgiving. Is it just a symbol of our gluttonous culture? Where our greed and instant gratification meet our self-indulgence and materialism? For whatever reason, we have devolved into this chaos and most unholiday-like spirit, and it grieves me. There is nothing sentimental or nostalgic about this ugliness. You would think in these dark economic times, that people would return to simpler and more genuine expressions of the holidays; that we would recognize that spending money we don't have is not a substitute for the things that really matter --- like making family memories, serving others and revitalizing our relationships with our fellow man and our God. When we lose these traditions, we lose our humanity. No, you won't find me in the rush that storms the doors and elbows their way down the aisles, pushing and shoving and fighting their way to the prize. Call me old-fashioned or illogical, but PLW and I are evolving towards a more spiritual celebration of the holidays. I find no joy or value in buying "things" just because it is expected. As Americans, we all have too much "stuff" anyway! I would rather receive one thing that was made or purchased with love, than mounds of gifts that were bought without thought or care. I would rather spend whatever precious time I have, with friends and family and really give something of value ... sharing of ourselves; listening to our hopes and dreams; and planning our futures. I know this sounds unfashionable and downright corny, but it's where I'm at these days. I'm tired of marketing and materialism and mayhem. Give me authentic demonstrations of our humanity; a show of brotherly love, compassion, charity, goodness and consideration. Those are gifts that will never be returned. That's the holiday season I want to celebrate. I do not get the madness either, never have.I'm not going out at all this weekend. When my mother and I owned a needlework and quilt shop a number of years ago, we started getting hit with this "you gotta open up" and we never did, which made these women furious. It was always "well everyone else does it", well, we don't so get over it. I am so glad I am not in retail anymore. I love handmade, homemade food goodies, and candies, and the love that went into making it. This madness shows just how brain dead everyone is, they have no imaginations, no thoughts, just buy from China and its a gift. You are so right! Everyone seems to want to buy whatever everyone else buys and what the marketers tell them to buy. No thought, no individuality, no personal thought. Let's get back to the true meaning of Christmas!